Phoenicia was a civilization to the north of Canaan. 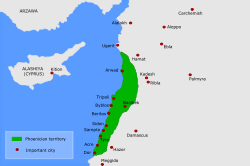 Phoenicia existed from 1200 to 900 BC. People from Phoenicia had their own language called the Phoenician language, which is important to many modern languages. They wrote with an alphabet from which the alphabets of Europe evolved. Phoenicians set up colonies in the Mediterranean region and beyond. Carthage was one of them. Phoenician traders went as far as the British Isles to buy tin. At their peak, the Phoenicians were a major power in the Mediterranean. ↑ "What was Historical Syria and Phoenicia? Is there confusion?". phoenicia.org. Retrieved 3 May 2015. ↑ "Phoenician Alphabet". phoenicia.org. Retrieved 3 May 2015. ↑ 3.0 3.1 3.2 3.3 N.S. Gill. "Carthage". About Education. About, Inc. Retrieved 16 October 2016. This page was last changed on 11 November 2018, at 05:45.